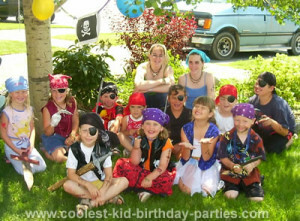 My Daughter Allyn really wanted a Pirate party so the boys could attend and play too. (Last year we did Cinderella’s Tea Party.) In the photo below she’s wearing a purple bandanna front and center. Bottom line is that THIS SITE gave me everything I needed, with a little embellishment and personal touch, to have the “Hit of the street” pirate party. (15 kids under 11 live on my cul-de-sac). It’s now one month later and the kids are all asking for next year’s idea now so they can anticipate the fun. And the moms are all glaring at me because their kids want the same kind of flash. Mommy dressed up as a Pirate Servant (I am sure the dads in the neighborhood are still calling me Wench)! When the guests arrived we had body paints and tattooed them, added beards, scars etc. to add to their costumes. Prizes were Parrots – a stuffed one, a garden ornament and a statue all from the dollar store. And every Pirate needs a parrot…. For Pirate theme party food, I served goldfish and Ritz Scuba Crackers with dip and we made Pigs in a blanket, cut in half and dipped in ketchup – we called them Peasant fingers. The cake was a slab decorated with Pirate stuff from the fish department of the local pet store (sunken treasure and Pirate Ship) with plastic coins around the outside. The last clue, following cake and food and gifts was lead to by my daughter (who had no idea where it was). She lead them to the X marks the spot where there was a Treasure Chest filled with Thank you treasures for each of her friends. We bought wooden treasure boxes at the dollar store. Then I painted each child’s name on and my daughter glued on sea shells and stones. We filled each treasure with pirate stuff, Chocolate coins, jewelry, tattoos and anything gold colored we could find for the “goody boxes”… the kids loved them.